Sam Wright got Archer off to a quick start winning the Shot. 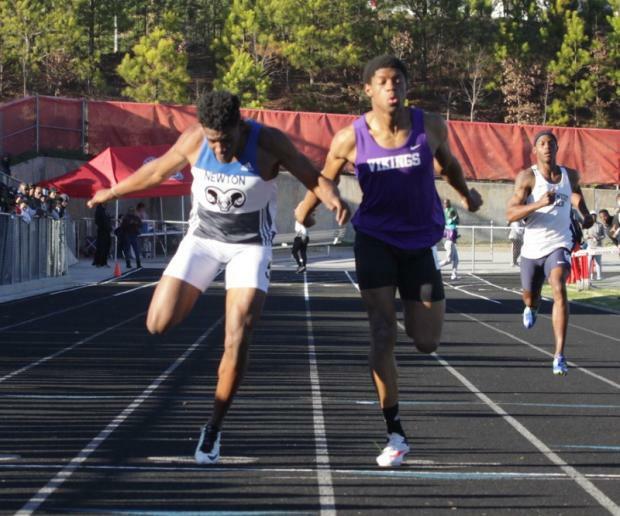 Boys Side: Archer manhandled the Boys field scoring 113 for a 55 point margin of victory over runnerup Lambert, with speedy South Gwinnett 1.5 points back in 3rd. The Tigers only won 2 events, but picked up a slew of 2nd and 3rd place spots to power them to the team win. Top ranked Putter, Sam Wright took the win in the Shot with a toss of 54-3 and Vaulter Daniel Surman had a bar of 12-6 taking the PV. Scoring big points were James Cragin placing a close 2nd in the 1600m and 3rd in the 3200m, 2nd in the 4x100 at 42.06, Derrien Wright was 2nd in the 800m in 2:02.50, Samuel Brown placed 2nd in the HJ with a bar of 6-4 and Daniel Robinson scored a pair of 3rds in the 100 and 200m races. Godwin outleans Brian Herron at the wire in the 400m. 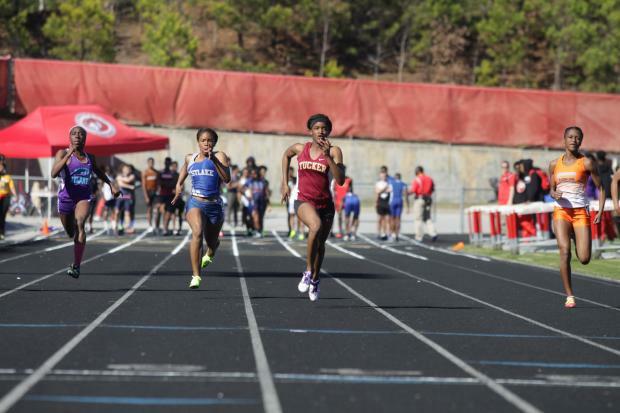 There are going to be some mighty great races in the 200 and 400m this Spring between 7A stars Elija Godwin of Newton and Brian Herron of Lakeside DeKalb. 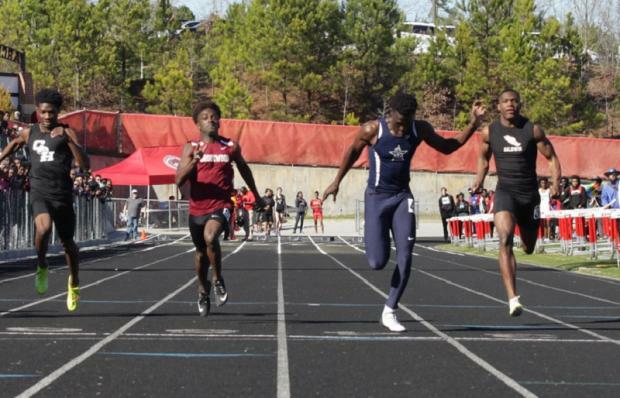 Toss Terry Conwell of 6A SW DeKalb in the mix, and its was on Saturday...But, Godwin ruled the day taking 1st in both races at 21.36 and 47.87. 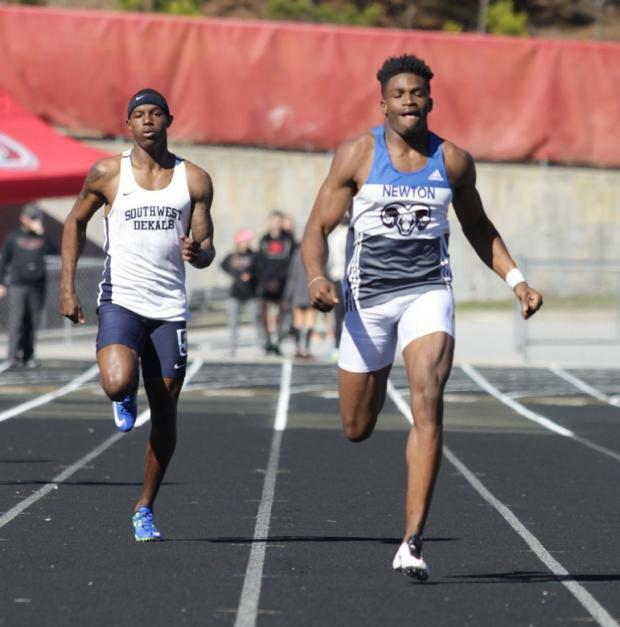 Terell Smith from South Gwinnett heated up the track taking the 100m dash in 10.68. Antuane Dennard of South Gwinnett had a big day. 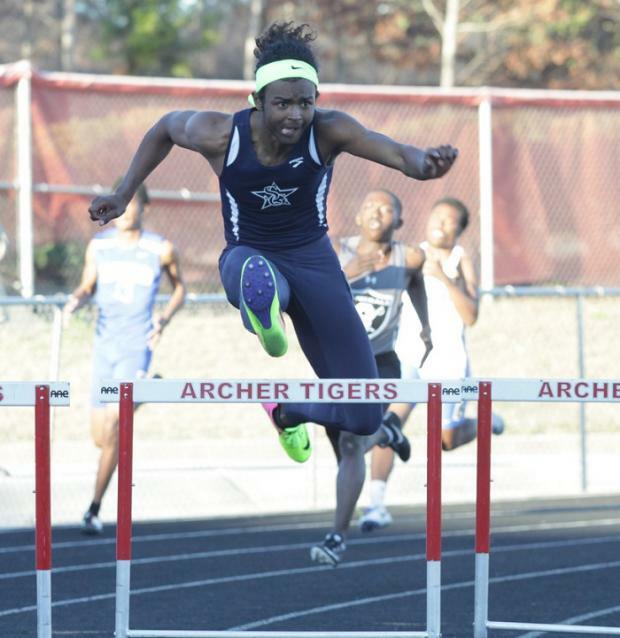 Seen here, he takes the 300h nipping Julian McDuffie of Shiloh and earlier won the HJ with a bar of 6-4 and was 3rd in the 110h at 14.36. 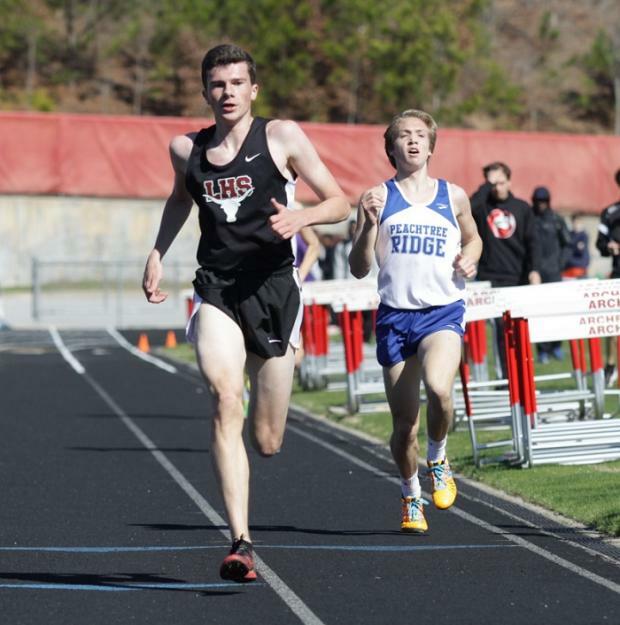 Tyler Fox of Lambert holds off Chase Condra for the 3200m win. Girls Side: In what could be an early glimpse at 7A State this season, Brookwood's gals earned a narrow 2 point victory over Westlake, with defending champ 6A North Springs 2.5 pints back in 3rd. Leading the Lady Broncs were Caitlin Tate, Lauren Flynt and Mackenzie Ellison.Tate won the 200m dash in 24.58, and placed 3rd in the 400m at 56.74. Flynt took a pair of 2nds in the distance events at 5:19/11:27 and Ellis won the 800m in a time of 2:19.23. 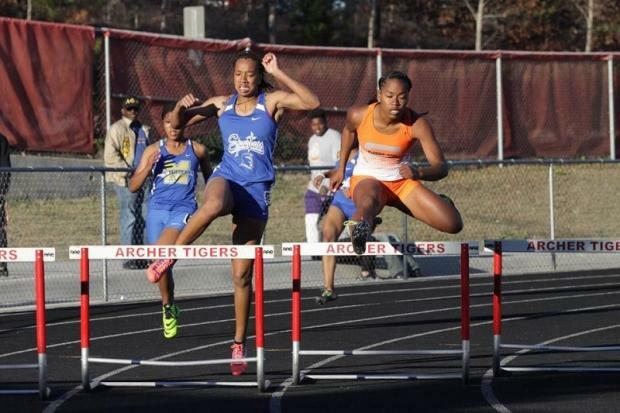 100 Hurdles race was spectacular as 8 Eilite times were achieved as Antonia Frazier of Tucker took the win at 14.08. Kaylah Lumsden of Tucker won the 100m dash at 11.64 as 4 girls achieved Elite times. 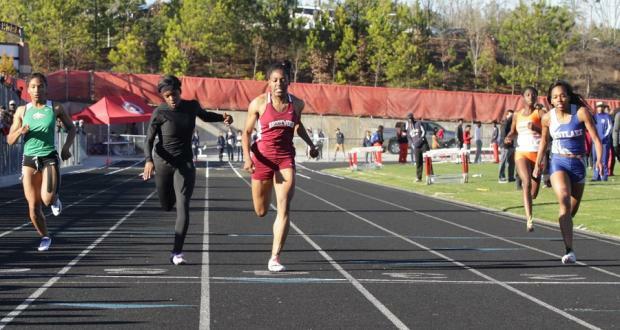 Caitlan Tate of Brookwood wins the 200m dash at 24.58. 4 Elite times were produced as well. Westlake and North Springs battled to the wire in the 4x100 with the Lions taking the win in 46.61. 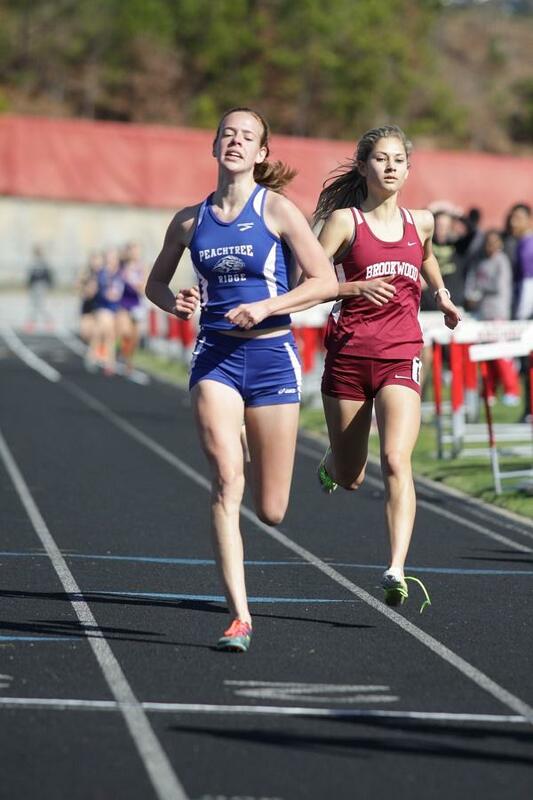 Mary Kathryn Knott edged Lauren Flynt in the 3200m. 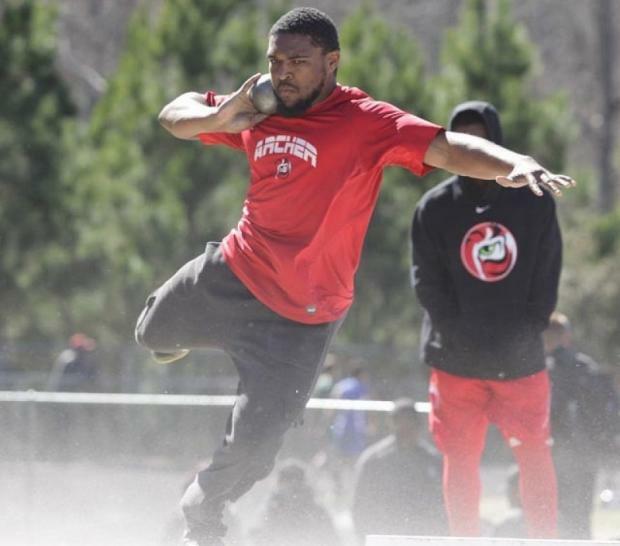 Coach Kasson of Archer commented, "Man it was a fantastic meet. Had about 4,000 people in the stands and the athletes were outstanding. Definitely one of the top HS Track and Field Meets I have ever seen. I had almost as much fun as watching these guys run as I did coaching my own kids. Such a great event!!"